Muscle soreness is a common problem for athletes, generally occurring after a workout or game. Intense training actually causes tiny tears in muscle fibers, which stimulates muscle cell activity and helps repair the damage and strengthen the muscles. As incredible of a job as our body is capable of repairing itself, there is no reason not to do everything possible to help the process of healing along. The sooner an athlete can heal, the more time an athlete can focus on training. 1.) 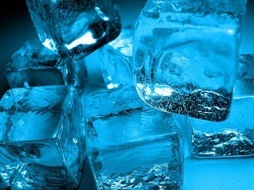 One of the most widely-used treatments for muscle soreness after the most strenuous workouts is an ice bath. Ideally this procedure should be done in an ice tub whirlpool, but it is entirely possible to use any type of tub and still get results. 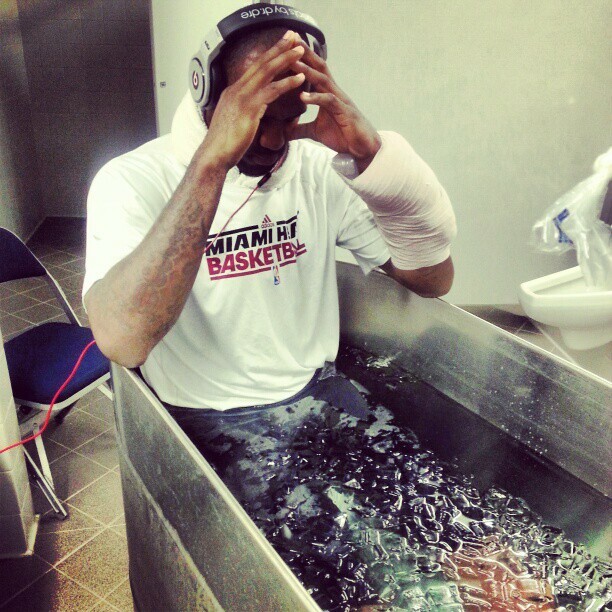 An ice bath serves a primary dual-purpose, reducing inflammation, swelling, and cramps, while removing waste products from the muscles and can help an athlete recover more rapidly from intense training. Start by drawing a shallow bath of cold water (approximately up to the hips) and get into the water before adding ice. Most ice baths are between 50 and 60 degrees Fahrenheit, with 60 degrees being considered the upper-level for therapeutic effect. When you are only soaking your lower body, it can help to keep your upper body warm in whatever manner is convenient. An ice bath should last at least 5 minutes, with the most effective amount of time being somewhere between 10 and 15 minutes, and never more than 20 minutes. This is a good time to eat your recovery snack in order to pass the time. Lebron in the ice bath. 2.) For those who have tried ice baths and don’t tolerate them well, taking an Epsom salt bath is an effective alternative. Similar to an ice bath, an Epsom salt bath can reduce muscle inflammation, swelling, and cramps. There are also some added benefits to Epsom salt, as the magnesium it contains has been shown to improve concentration and sleep, while the sulfate ingredient can help the body get rid of toxins, further enhancing recovery. First, run a tub of hot bath water that barely covers your body when lying down. Next, dissolve 1-2 cups of Epsom salts in a jug and add it to the bath. Then, get in the water for about 15 minutes to soak, without using any soap or oils. Finally, massage out all of the tighter areas you can reach and try to rest for 1-2 hours afterward. Epsom salt is inexpensive and easy-to-find, making it a very feasible tool to use for recovery. 3.) Another method for reducing muscle soreness or cramps is the use of a foam roller, which is a cylinder-shaped piece of hard-celled foam. Foam rolling is also known as self myofascial release (SMR), and the basic idea of the foam roller is quite simple, as essentially, it is used to massage (roll) out knots or other sensitive areas within your muscles. Using a foam roller, you can manipulate your soft muscle tissues by applying pressure in these sensitive areas, allowing you to stay healthier or recover from injuries quicker. One of the nicest things about the foam roller is that it is as easy-to-use as it is effective. 4.) Post-workout nutrition is sometimes overlooked as a source of recovery for muscles. Following an intense workout, there is a small window of time, about 2 hours, when what you eat can be used to repair your body. Protein is obviously important when it comes to muscle repair, but it is equally important to get adequate carbohydrates to recover after your workout. It is also important not to forget to rehydrate before, during, and after a training session or game. You should consume approximately 8 ounces of water for every 20 minutes you work out. If you feel exhausted after your workouts, make sure you examine your nutrition and hydration habits to make sure you are getting what you need. 5.) Most people stretch and warm-up prior to working out, but most people neglect stretching after a workout. Much like foam rolling, static stretching is beneficial when the goal is to relax your muscles. To perform a static stretch, take a muscle to the point of tension and hold it for about 30 seconds. After working out, you have the added advantage of your muscles already being warmed up, increasing your flexibility. Static stretching will pay major dividends, helping you recover faster and limiting that tight feeling that often comes after a workout.